We are delighted to announce that British artist Mella Shaw is combining forces with us to promote the ReCircle message. 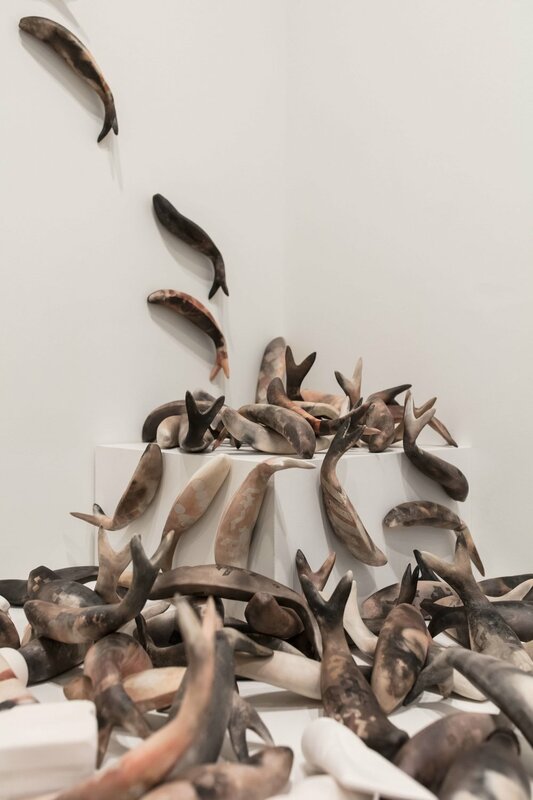 Mella, whose stunning installation, HARVEST, was featured at the Collect Open, Saatchi Gallery, 2018, London, and is currently on a nationwide tour, is passionate about the threat to the oceans from plastic. 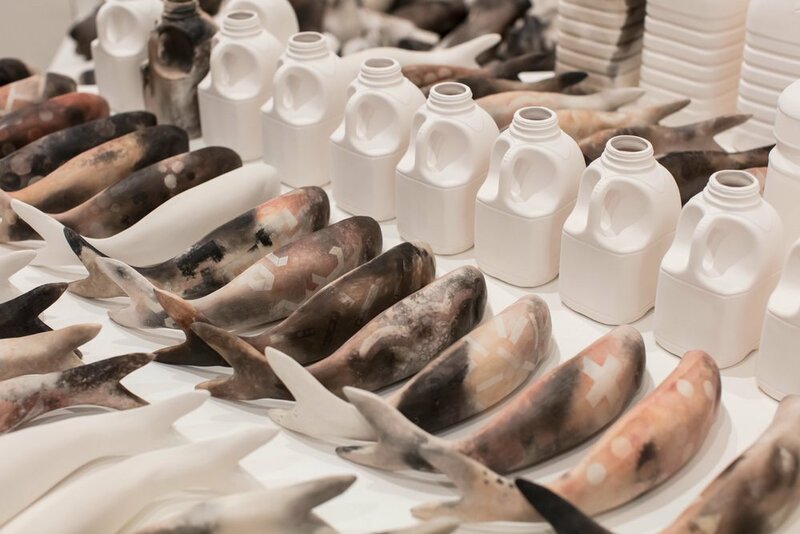 Featuring hundreds of exquisitely detailed clay (press-moulded, slip-cast and smoke-fired) “plastic” bottles and containers and leaping fish the large scale installation depicts the appalling toll discarded plastics are taking on our marine-life. Having learned the horrifying statistic that, by 2050 “there will be greater weight of plastic in the oceans than fish” (Ellen MacArthur Foundation, 2016) Mella created HARVEST, which was featured at the recent Hampstead Affordable Art Fair, London to draw attention to the plight of our sea-life. As a mother of a young boy she is committed to getting the message across through her strong but delicate art works. But she has also been searching for practical ways to combat the desperate situation. “It’s one thing to make people aware of the awful damage being done to our marine life but we need concrete ways that we can help prevent the looming catastrophe,” says Mella. She agrees it would be great, but unrealistic to expect people to stop using plastics completely and, with Forbes announcing recently that, “globally humans buy a million plastic bottles per minute” it’s clear this will not happen any time soon. Worse still, a staggering 91% of plastic bottles are not recycled. “Realistically we will still keep using plastic bottles and containers, so it’s vital we can ensure they are close-loop recycled so we don’t need to keep producing containers and bottles from virgin materials at this obscene rate”. Mella’s exhibition HARVEST is currently on show at the Scottish Fisheries Museum, Anstruther, Fife until 30 September and then at Art & York, 26 – 28 October. See www.mellashaw.co.uk for more details of Mella’s work. You too can join forces with ReCircle. Share this page with a friend, and sign up to our mailing list below to stay informed about our campaign to 100% close-loop recycle the plastics we use and discard on a daily basis.